Just as we thought we had survived the nauseating inundation of political TV commercials preceding the mid-term elections, we are now faced with a new onslaught of screeching 30- and 60-second holiday buying beseechments. While loud and pushy and annoying, they are at least honest. You can get great discounts in the greed-filled run-up to the commemoration of Jesus' birth. But one commercial confounds and angers me more than any other: the series of ads comparing Microsoft's Surface Pro 3 to Apple's MacBook Air. 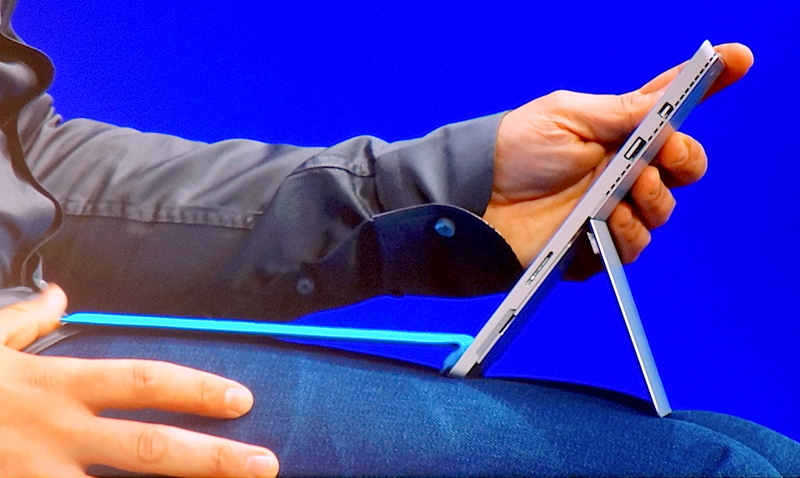 First, Microsoft proclaims its new tablet is a laptop replacement. Without commenting on Surface Pro 3's other pros, this is claim, from a physical POV, is absurd. It's no coincidence that the commercial shows the Pro sitting on a tabletop. Try balancing and effectively typing and/or drawing and/or touch-screening while the Surface Pro 3 is on your lap and it soon becomes immediately apparent -- at least it did to this inveterate lap-top laptop user -- that it is no laptop. Unlike the MacBook Air currently comfortably ensconced across the tops of my thighs as I type this, the 11.5-inch wide Surface Pro 3 will slip between your legs if you spread them too far apart or you purposely or accidentally nudge it. Or, if its kickstand slides too close to the end of your lap, it'll topple over the edge of your knees. Pro has to be positioned rather particularly to keep it both balanced and in a comfortable spot to effectively type or draw or touch it. Perhaps I am defining the term "laptop" a bit too literally, you say. Most people don't actually use a laptop on their laps, you say. You say wrong, at least in my live event reporting world, where folding-chair hunched tech reporters regularly rest their laptops on their laps recording the deathless comments of CEOs, marketing and product managers. But Surface Pro 3's laptop disfunction is not the worst crime the Microsoft Mad Men commit in these ads. Imagine a commercial in which Ford flaunts its F-150 pickup's load-carrying and towing capacity against that of, say a Chevy Camaro convertible. See? The F-150 can carry a 3,300-pound payload; the Camaro, only a pair of beautiful rich people. Or if Barcalounger cackles concerning the comfort of its recliner compared to Herman Miller Aeron desk chair. See, lean all the way back with your legs supported and store your soda in the cup holder; tilt way back in an Aeron and you'll fall over. Or if LG lauds its microwave oven's abilities vs. that of a T-fal toaster. See, the LG microwave can pop a bag of popcorn in just two minutes; the bag doesn't even fit in those T-fal toaster slots! These are, of course, purposely absurd comparisons. And so is comparing the touchscreen removal properties of a tablet vs. those of an an undetachable untouchable screen of an Apple laptop. A laptop and a tablet are two different devices that serve disparate functions and constituencies. At the heart of its design intentions, a tablet is a play device on which you can work. At the heart of its design intentions, a laptop is a work device on which you can play. Do the work-play twains meet for some people, even a lot of people? Yup. But just as a pick-up truck should be compared to other pick-up trucks, recliners to other recliners and microwave ovens to other microwave ovens, a laptop is a laptop and ought to be compared to another laptop, and a tablet is a tablet and ought to be compared to other tablets. Plus, what computer buyer is EVER tossing and turning night-after-night unable to decide between a Microsoft tablet of any kind vs. an Apple laptop? If anything, that potential Surface Pro 3 buyer is far more likely to be alternately considering a Windows laptop, which may or may not also offer a touchscreen. If you're going to promote the comparative virtues of the Surface Pro 3 it ought to be against, say, an iPad Air 2 to which you need to add a separate keyboard/stand and a separate stylus and maybe still not get something as integrated or elegant. That's fair, even if real-world comparisons have failed miserably. But to say that the Surface Pro 3 is a laptop replacement and an alternative to an Apple MacBook Air is as stupid as comparing a pickup truck to a sports car, a recliner to a desk chair or a microwave oven with a toaster. And it seems Microsoft is paying the price for its comparative perfidy.